Girls of the Sun mixes the immediate power of contemporary news footage with a story of women bonding in the most horrific conditions: on the front lines of fighting ISIS in northern Kurdistan. 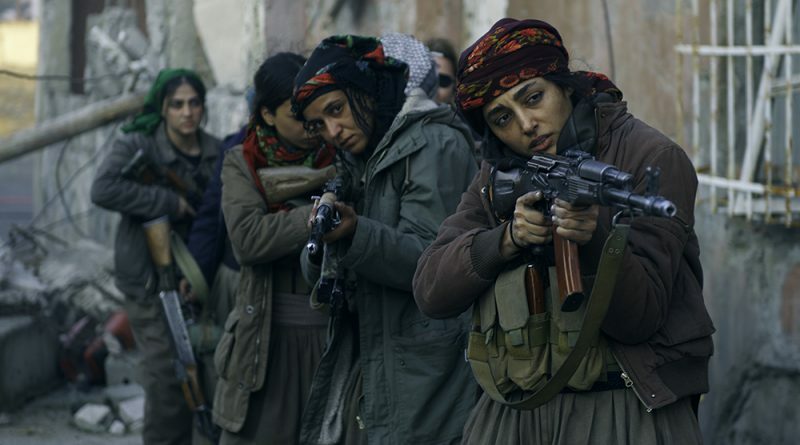 French filmmaker Eva Husson’s film centers on the fact-based story of a female Kurdish unit within a larger battalion that’s fighting the terrorists who invaded their village, executed the men, raped and abducted the women, and stole the male children in order to indoctrinate them. For these women, many once professionals like the compelling central character Bahar, played by the gifted Iranian actress Golshifteh Farahani, who was a lawyer, wife and mother, fighting back is all they have left. It’s particularly rewarding for them to kill ISIS because these men believe they can’t get to paradise if a woman kills them. The scenes of these young, desperate women wielding automatic rifles and hunting down the enemy are disturbing so it’s wise that Husson has layered in a predictable but still effective story about French journalist Mathilde (the terrific actress and director Emmanuelle Bercot) who is embedded with the women’s unit, and her growing friendship with Bahar. Mathilde wears an eyepatch, the result of being hit with shrapnel while covering a gruesome battle in Syria. She seems clearly modeled on war correspondent Marie Colvin, who was played by Rosamund Pike in last year’s “A Private War,” though she is treated here as a fictional character. Sometimes “Girls of the Sun” seems like two different movies; other times, the balance between the camaraderie of the women fighters who cling to all that’s left of their shattered lives, and the growing respect and dependence between Bahar and Mathilde, who’s own journalist husband was killed and who misses the young daughter she’s left at home, provide some emotional reprieve to the difficult scenes of war, danger and death. Flashbacks to how the women were attacked, abducted and assaulted also are harrowing but necessary to understand why they’ve turned into warriors. Although one wishes Bercot had a bit more to do, the performances are uniformly solid, particularly from the charismatic Farahani. Husson directs the complex action with escalating tension and horror, though it’s likely just a glimpse into what these women suffered, and what they still endure. mixes the immediate power of contemporary news footage with a story of women bonding in the most horrific conditions: on the front lines of fighting ISIS in northern Kurdistan. Although one wishes Bercot had a bit more to do, the performances are uniformly solid, particularly from the charismatic Farahani. Husson directs the complex action with escalating tension and horror, though it’s likely just a glimpse into what these women suffered, and what they still endure. Loren King's features and film reviews appear regularly in the Boston Globe, Boston Spirit magazine and the Provincetown Banner. She writes Scene Here, a localfilm column, in the Boston Sunday Globe. A member of the Boston Society of Film Critics since 2002, she served as its president for five years. Copyright © 2019 ALLIANCE OF WOMEN FILM JOURNALISTS. All rights reserved.